Ever been to Canada during the winter? There's a reason why Canadians flock to Caribbean and Southern US destinations during the winter. Canadians love the Caribbean, particularly Mexico, Cuba, the Dominican Republic and Jamaica. Other popular destinations include Florida, Arizona and Hawaii. The airline I used to work for used to run YYZ-VRA X16 weekly during the peak holiday periods like Christmas and March Break. Double daily with a 3rd frequency on select days, all 737-800's. That's over 3000 seats per week for just one of the 5 airlines that fly YYZ-VRA. I've been to Cuba 3 times but never Varadero. Its a cheap holiday with nice beaches and people, the food and accommodations aren't the best but it is getting better. Get off the resorts and you'll discover the real Cuba, really friendly people, tons of history and plenty of excellent traditional food and drinks. One of the reasons I don't like Cuba is exactly your point, its all Canadians in the resorts down there. I prefer Punta Cana or Cancun as you get more of a variety of people from different parts of the world staying in your resort but that's just me. Air Transat used to fly their A310s from YYT to Varadaro and Puerto Plata. Newfoundlanders LOVE all inclusive Caribbean vacations! Nothing like a little foon in the soon me 'by! 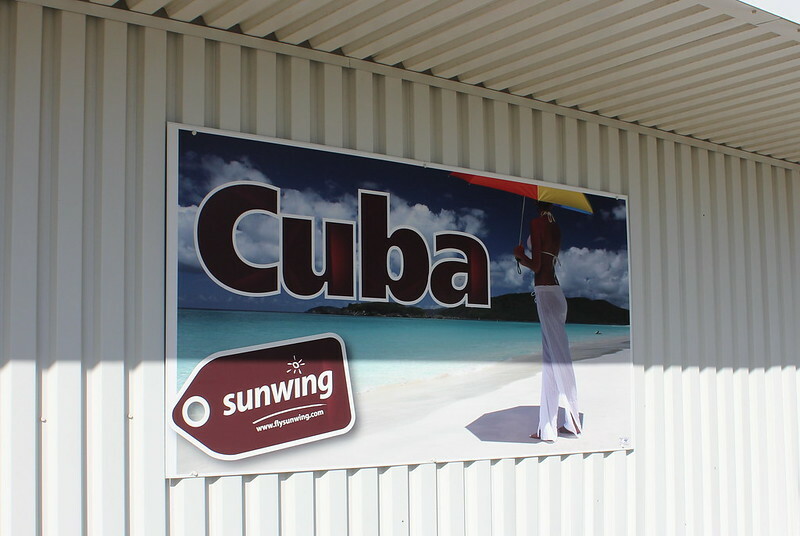 A poster at Gander Newfoundland for Sunwing flights to Cuba (and reminiscent of a time when Aeroflot, Interflug, CSA and Cubana all stopped in Gander to refuel on their way to/from Havana and the Eastern Bloc . Because of the US embargo, Cuba can't really draw much from the US in terms of tourism and because of the same embargo procuring the types of goods needed for true luxury resorts/hotels to draw people from further afield can't happen. That leaves Canada and Latin America to draw from. A good portion of Latin America has mixed/lukewarm feelings towards Cuba because of their own flirtations withs communism/authoritarianism. That leaves just Canada. This lack of diversity is seen in other airports in the country as well. For example all international departures today 11/4/19 are to Canada. Some spots in the DR are also quite Canada heavy. What does Varadero have that Cancun or Punta Cana don’t? In places like Mexico and the Dominican Republic, prices are generally set in US dollars. With exchange rates, this can make things more expensive for Canadians. Similarly, the European Caribbean islands like St. Martin are priced according to the euro. As the dominant tourist in Cuba, prices tend to stay more aligned with Canadian budgets. It's also possible that some Canadians might enjoy the lack of Americans and other nationalities. Some might also enjoy feeling a a bit subversive, visiting somewhere that is forbidden to Americans, in the way that some people like to visit North Korea. And obviously, some people just love Cuban music, dance, and culture. The best place to hear real son Cubano is still in Cuba. Cuban vacations have been the cheapest option most of the time, but the DR can be competitive nowadays. I picked a random date next week on a popular travel site and quickly found a 7 day 4 star all inclusive resort in Varadero for C$1235/pp including flights and fees from Halifax. Punta Cana was C$1539. That is why Cuba is so popular. I picked a random date next week on a popular travel site and quickly found a 7 day 4 star all inclusive resort in Varadero for C$1235/pp including flights and fees from Halifax. There is one out of YYZ for one week, all inclusive for CA $685, including airfare, taxes and fees. That US $512!! Do you really want to enter Americans into a contest about fashion faux pas? Winnipeg born and raised. Can confirm. I haven't spent a Christmas at home once in the last 7 years. Looking at Varadero Today. these are the departures. I'm curious why flights to the same destinations often seem clustered around the same time. For example Sunwing has 2 flights leaving within 5 minutes of each other to Halifax and two at the same time to Toronto. Why not spread them apart instead of wing by wing? Likely trying to pick up capacity that the MAX outage has caused and still get people home at or close to their original schedule. Also traffic can demand that. I used to work for CanJet and on our Carribean days it felt like I was sending a plan to and from the same airport every 5 minutes. It makes sense though, the staff can ramp up for a full day of activity, and then all the work is done. better to have full staff for 8 hours vs 3 people 4 times a week for 3 hours a day. Plus vacation packages tend to be very day of week specific, so you will have a full turnover in one day for every hotel. Heck I did a FDF to CUN and in addition to 3 of our planes there were 3 TS A330s from YYZ and YUL and an A310 from somewhere else. It's crazy. Quick who from outside of North America can tell the difference between a Canadian and an American? Not too many and even many Americans can't. I would guess very few could. That is why most of this is said Tongue in Cheek. Although either side of of the fence would like to think otherwise, with similar values, upbringing, religion, etc ... we are virtually identical. I guess you could go from the us to cuba if you want to go to cuba. In order to provide an informed opinion to this thread I’m going to fly to Varadero this Saturday for a week of sun, rum and cigars . I’ll report back later. In terms of price it can vary. This year for a family of three Varadero was about $1500 cheaper than Punta Cana. When we went to Punta Cana two years ago they were about the same price when i was shopping. Not a reason but a bonus is that I plan to buy a humidor worth of Cuban cigars to bring back with me. Not sure why there's a pattern in terms of arriving from the same place, but from a resort management prospect, if you're offering packaged holidays with flight, hotel and resort transfers, it's much easier to have flights arrive together than throughout the day. This way they can combine transfers to hotels from multiple flights and the coaches all leave full rather than with just a few people. Much more efficient. It's more like the other way around. What does Varadero NOT HAVE that Cancun and Punta Cana DOES? All these flights are part of holidays packages and very few seats are sold "dry". Being for vacationers, schedule planning is different from typical business routes like YYZ-LGA for example, that's why an airline like Sunwing can depart two services to the same point 5 minutes apart. Same to Cancun or Ibiza or the Canaries. I remember at Monastir MIR we used to get two LTU 400 seaters from DUS within 10 minutes or two Condor DC-10 from MUC and so on. Cuba-US traffic is strongly regulated and demand and customers are different thus the much fewer flights. Now hope is at least 50% of this tourists from Canada went out of their all-inclusive so-called resorts and discovered real life behind their Instagram stories and selfies. I’ve spoken to Americans who’s image of a Cuban Resort is a bare light bulb hanging on a wire from the ceiling! …..but they are just as nice as you will find anywhere else in the Caribbean! You don’t have the verity of food you might find elsewhere especially meats but the locally grown fruits and vegetables are excellent! They are cheaper exactly because there are no American's driving up the cost. Europeans flock to Cuba too, but mostly during summer holidays (which, in EU, are far longer than anything US population can dream of). So, yes, in summer, many Germans, also Brits, etc. Embargo is not a problem for tourism, but it does increase prices. For Europeans, Cuba is more expensive than Dominican Republic for the same level of service, because the country & economy is fkd up beyond belief. Even CocaCola is shipped from Mexico, or at least was, when I was there. Dictatorships are usually very safe for tourism and Cuba is no exception, so you can go around without fear, and since the country is impoverished, it is essentially frozen in time. Want to see spanish architecture? Go to Cuba, in Spain, it is drowned in new buildings. In Cuba, it is still 50s. Varied times work for business travel. When the lion's share of you pax are on package vacation it keeps cost down for everyone to arrive and lave in waves (think coaches, welcome staff, ground logistics etc). To accommodate this without adding bugger types to the fleet you have flights leaving at the same time. You see this a lot Canadian vacation ops. I've flow YYZ-PUJ-YYZ multiple times on TS in the last two years. All but one time we were chased by another TS bird. I once flew on a Air Transat L10-11 from YYZ-PUJ on a Sunquest Holiday. Those were great charters to be on. As for Cuba I have been 4 times and love it. Much nicer compared to Cancun and Dom Rep. The cultural highlights in Cuba allow you to have some chill out time on the wonderful beaches but also to learn something about the country and tour around a bit. In the DR, Cancun or Jamaica..…you just don’t wander into the local village on your own. You take an organized tour. In Cuba its different……you can take a tour into Havana but its totally safe to just walk around yourself and experience the local history and culture. Yes. I would suggest that Cuba is one of the safest vacation spots around. Without getting too political, the locals are terrified of the (very visible) police. My last few visits to Cuba involved renting a house in Miramar (suburb of Havana) and renting a car. What a great way to see an amazing place! All these flights are part of holidays packages and very few seats are sold "dry". Being for vacationers, schedule planning is different from typical business routes like YYZ-LGA for example, that's why an airline like Sunwing can depart two services to the same point 5 minutes apart. Same to Cancun or Ibiza or the Canaries. Ibiza is not resort-oriented at all. Most flights are regular and catered to the independent traveller. Canarias is definitely more resort oriented, specially the less populated islands like Fuerteventura or Lanzarote (Tenerife or Gran Canaria are more mixed). I haven't been to Cuba but I heard several times that many things have special prices for foreigners to be paid in USD. E.g. something as easy as getting WiFi outside resorts means buying expensive WiFi access; it is not as easy as getting free wifi anywhere or buying a SIM card with some GB of data like in Mexico. Absolutely. There are probably more Canadians in Maui during the wintertime than any other group. At the middle shopping center in Kihei there are three flags flying: the US flag, the Hawaiian state flag, and the Maple Leaf. I can't say that I blame them, although they do tennd ot make getting good dinner reservations difficult! In the cases of WG and TS, it also has to do with maximizing aircraft utilization, so that one aircraft can do two rotations down south in a single day. As such, they all follow the same pattern and are all clustered together from each base/station. The Turks and Caicos had shown interest in joining Canada a few years ago. You guys could have your own tropical islands if you can work out a deal! Thanks for all the info on the similar arrival and departure times. That makes perfect sense when your resort is turning everyone over on the same day. I think its more common in Europe and Canada to block out a full week like that as opposed to Americans who will try to go for 4-5 days. I'm thinking you might notice the Canadians more in the resorts because it is easier for them to access them. They can just book online, or through a travel agent without a problem. While U.S. travel to Cuba restrictions have eased. You still need to go on a cultural visa (the most common for tourists) and they are often heavily structured with stays in boutique hotels and home stays. You need to buy a very specific package as opposed to just 7 days of fun in the sun and make it up as you go along. I believe that is why so many frequencies were returned by the U.S. Carriers. Homer: Marge, it takes two to lie. One to lie and one to listen. You mean PMI, Palma de Mallorca? That would be a long, expensive flight for a beach holiday. Also, the high season for beach holidays is winter around here. The temperatures at Mallorca are too low in winter even for Canadians. Canadians, as well as Europeans have been going to Cuba for decades. But when the travel restrictions for Americans was ease it never really took off for Americans. The whole thing was over as soon as it started. Are you American? How did you rent a car in Cuba? Maybe I should PM you but everything I have read has said it very difficult for Americans to hire cars in Cuba. You can't use credit cards and insurance is expensive. Going back to the thread, there is nothing really to add other than the obvious. Canadians go to Cuba because it is less expensive than similar resorts in the Caribbean. There might be a slight difference in amenities but just like anywhere, Cuban resorts know their customers. That flight board has a lot more Canadian flights than most Canadian airports. spoke with someone at a resort in Cuba recently. They said AC was pumping, almost too cold. Resort had an old Russian AC unit that use to be used for a hospital......not a joke. They said AC was pumping no issues in resorts. Oh I don't know... How about the right of your bartender to tell you what he thinks of his government, without winding up in jail? I am Canadian. But you are right, the process is cumbersome due to credit card restrictions. I booked online and gave my credit card information online. (After checking with VISA first, as I was suspicious. It's all cool and they watch it closely). It can only be a credit card drawn on a non-US bank. If you are going to pay in cash. (Like just about every other transaction in Cuba), then it must be paid in full, upfront with a deposit. I held the reservation with the credit card, but paid in cash when I returned the car. Then called VISA as soon as my cell phone worked to confirm no charges were taken. You must purchase their insurance. It is not cheap. For a small 5 seat car, about the size of a Civic, with A/C and a standard transmission, it was about $200US a day, including insurance. That being said though ... I honestly can't imagine staying in Cuba, off of a resort, on your own, without renting a car. South Americans (Argentinians and others) love to go to Cuba too. An affordable Caribbean, with beaches and climate impossible to find at home, language is the same; there is Brazil closer, but lately Brazil has turned into a dangerous destination. Cubana flies from Buenos Airess to Havana and Cayo Coco; COPA does good Cuba business from 5 Argentinian cities to Cuba via PTY and LATAM & Avianca also take a piece of the pie, albeit smaller. Veradero is popular because of price but you are correct that things are changing. Prices in Dominican Republic and Mexico can be fairly competitive with Veradero. There was a time when Veradero was usually half the price of Cancun. The only all-seasons beach destination in Europe are the Canary islands and it's not even guaranteed you wil get temperatures like anywhere in the Caribbean as it's sub-tropical. Winter max. temperatures can stay below 70F/20C, although high enough for some people to get into the water definitely not for me. Max. winter temperatures in the Balearic islands don't get above 70F/20C so that rules out Palma as an all-season beach destination. If a non stop link from Canada to a beach destination in Europe it will be to the Canaries, although I doubt it will ever happen. No place in Europe can compete with the Caribbean on the US/Canada market, not only price but weather wise. P.S. before someone jumps in, Canaries are in geographically in Africa but politically in Europe. Just back from seven days in Varadero, my first time in Cuba. The vacation itself was great, but I would say the Varadero airport appeared to be busting at the seams on peak travel Saturdays. When we arrived we were third in line for an available gate, meaning we sat on the tarmac for 40 minutes or so before one became available. On departure day, we were one of four Air Transat flights departing around the same time (Toronto, Ottawa, Montreal, Halifax) and the lineup for check-in extended well outside the airport terminal into the parking lot. Air Transat's ground services contractors didn't seem to be very on the ball so perhaps that exacerbated things. Exactly .... I was about to write the exact same thing when I came across your post ! Good aircraft utilization.